It was fun to watch this movie after such a long time. I have fond memories of watching it as a child, I can remember thinking it was the moment in time when the world came in to colour having looked at old black and white family photos. Yes, as a child I thought the past was in black and white! It also evoked my childhood fear of the Wicked Witch of the West played wonderfully over the top by Margaret Hamilton. 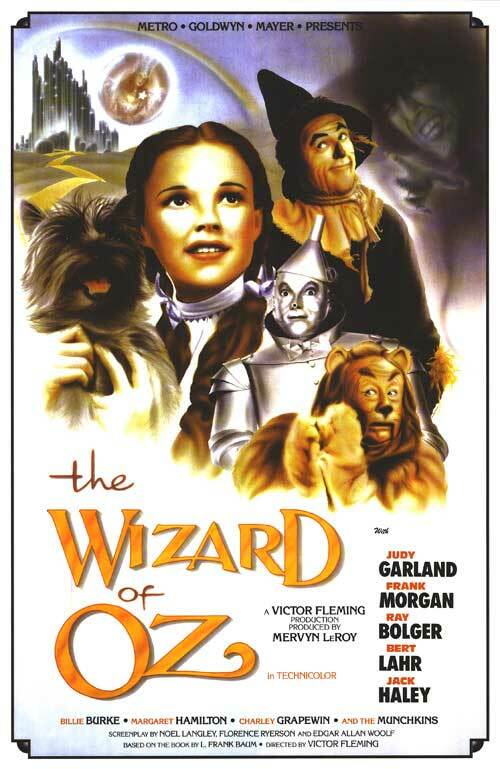 The film starts off in a rich, monotone Kansas and Dorothy (Judy Garland), dreams of adventure in far away lands. She lives with her auntie Em and uncle Henry on a farm and decides to run away after the town bully, Miss Gulch, tries to take Dorothy's dog Toto for apparently biting her. Whilst running away, Dorothy runs into a Professor Marvel, a travelling fortune teller who foresees auntie Em, ill and distraught at Dorothy's disappearance. Guilt ridden, Dorothy runs home. 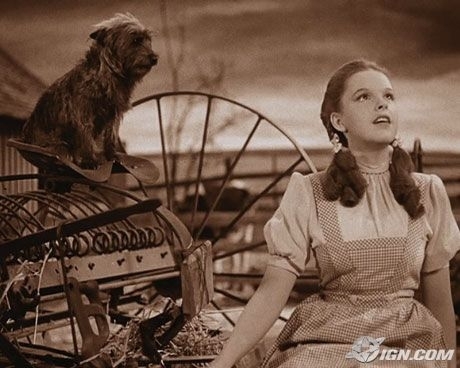 Unfortunately when she arrives the house is struck by a tornado, both Dorothy and Toto are swept off with the house. Even before we arrive in OZ, the Kansas set is impressive added by an impressive tornado affect for the time. They crash down in Munchkinland, home to the Munchkins and ruled by the Wicked Witch of the East, at least until she was crushed by Dorothy's house. 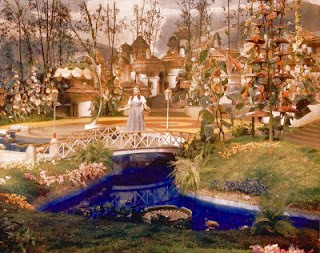 Dorothy enters the"technicolour" world, with huge set paintings depicting lush hills of grass and mountains as far as the eye can see. The introduction of colour and shear scale of the sets must have been awe inspiring for people in the late 30's. "Nothing comparable has come out of Hollywood in the past few years to approximate the lavish scale of this filmusical extravaganza, in the making of which the ingenuity and inventiveness of technical forces were employed without stint of effort or cost. Except for opening and closing stretches of prolog and epilog, which are visioned in a rich sepia, the greater portion of the film is in Technicolor. Some of the scenic passages are so beautiful in design and composition as to stir audiences by their sheer unfoldment." The good Witch of the North explains to Dorothy that the only way to get home to Kansas, is to go and see the Wizard of Oz in the magical Emerald city. 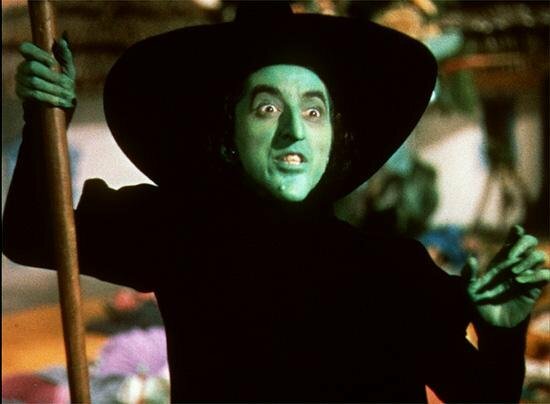 Having acquired the ruby slippers from the dead Witch of the East, Dorothy has become the target of her sister the Wicked Witch of the West (Hamilton). Dorothy must follow the yellow brick road and avoid the Witch at all cost. Along the way, Dorothy makes some new friends who look suspiciously like workers on her farm back in Kansas. The first is the scarecrow, (Ray Bolger) made from hay and straw who longs to have a brain. The second is the tin man, (Jack Haley) made from nuts and bolts but without a heart. The third is the lion, (Burt Lahr) the would be king of the forest if he wasn't a coward. Together they seek out the wizard to achieve their goals. The stage designs are impressive throughout and make great use of forced perspective. The forests are thick and lush but also hold a sinister tone in certain parts. The Emerald city is vast and modern looking for it's time, very art deco in style. They arrive at the city and are deflated when the great wizard demands they bring him the broom of the Wicked Witch of the West. Before they reach the Witches castle, Dorothy is captured by the her flying monkeys. 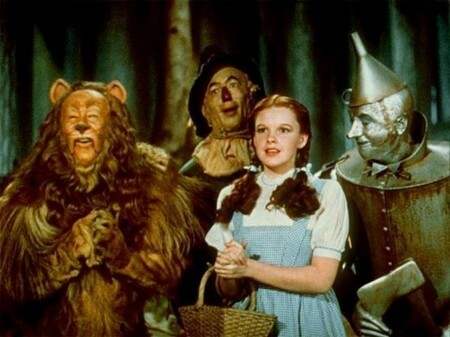 Toto manages to escape and finds scarecrow, tinman and lion and leads them back to the castle disguised as guardsmen. The Witch, unable to take the ruby slippers forcefully, puts a time limit on Dorothy's life using an hourglass. 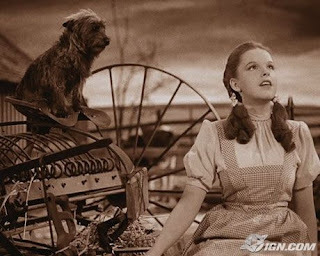 Dorothy is rescued by Toto and the others but they get cornered and the scarecrow set on fire. Dorothy uses a barrel of water to douse him and in doing so, wets the witch who melts away. The guardsman, free from the witch's command, allow Dorothy to take her broom. They return to the Wizard, who isn't pleased to see them. He denies them their prizes, until Toto unveils him to be a man behind a curtain with levers and a microphone. Subsequently this man, (from the same World as Dorothy), gives the scarecrow a diploma, a medal of bravery for the lion and a ticking heart shaped watch for the tinman. He can also take Dorothy home in his hot air balloon, which accidentally takes off without her. Distraught, Dorothy is visited again by the good witch of the North, who informs her she's always had the power to get home, with her ruby slippers. With three clicks of her heels and saying "there's no place like home", Dorothy wakes up in her bed with everyone she loves around her. They discard her story as a bad dream from a nasty knock to her head. Dorothy is so pleased to be home she doesn't mind that they don't believe her. "Lavish in sets, adult in humor, it is a Broadway spectacle translated into make-believe." 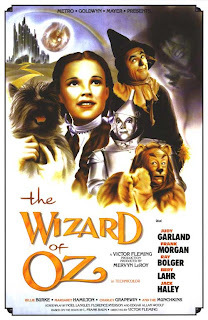 The Wizard of Oz is essentially about the fear and excitement of growing up, leaving home , going to new places, meeting new people friends and foes. 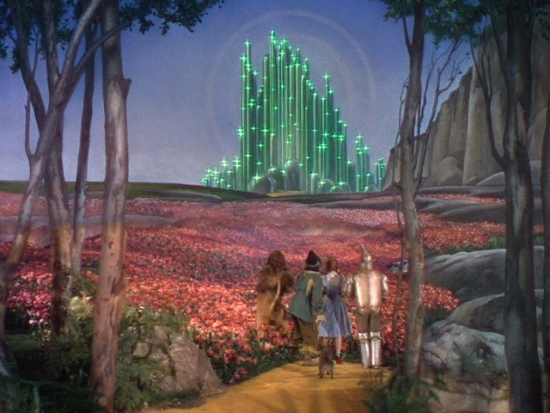 Oz is metaphorically used as the big wide world, much different to the humdrum life at home. It is a story which every child should and will continue to watch for decades to come. It's underlying message assuring us of the security and comfort of home and family. The set designs, make up affects and technological colour advances were so ahead of it's time, it doesn't surprise me in my research to find it was dogged with production problems. Although it nearly bankrupted the studio the enduring success and multiple spin off's seal it as a timeless classic. "It's a movie that speaks of Hollywood's unacknowledged fascination with the exotic, the mad, the unreal. Despite its earnest endorsement of the idea that there's no place like home ... well, frankly there are plenty of places like boring old home, but nothing's like Oz." Lots of solid research sitting beneath your visualisations - good stuff, and your thumbnails and excursions into Photoshop are encouraging. That said, one of the key things I'll be asking students at the crit will be the ways in which their visual concept shaped the design and execution of the final 3 scenes. Remember that you're 'imagineering' scenes for cg animation adaptation of 'She' - so that also rules in a more obviously constructed system of design - greater expressionism, systems of colour and shape; also, different visual languages, so, for example, a style used throughout to shape landscapes that also concurs with some kind of indigenous art form or style appropriate to the original source material; I've been giving students the cartoon show Samurai Jack as an example of how Japanese art forms are integrated (in terms of flat planes and aesthetic) are used to shape the entire geometry of the world. Don't be afraid of looking to 'isms' for a more idiosyncratic style - impressionism, abstractionism - you're in a plastic universe - not a real world one, so perhaps be prepared to go bold and stylised - if only then to come back to some middle ground. Yes, you need to produce accomplished digital paintings and yes you need to demonstrate understanding of depth perception and perspective, but you also need to demonstrate STYLE! Re. your reviews; in terms of content and quotes, all is good and you have a good eye for a source that opens up the subject. That said, I'm encouraging students to use these mini-assignments as opportunities to develop their academic voice - i.e. to adopt comfortably the kind of formal, impartial tone expected in the formally assessed essays. For this reason - even though I LOVED the bit in your Wizard of Oz review in which you talked about how you hadn't seen it since you were small (people are meant to enjoy these films obviously!) - I'd just ask you to watch the tone; keep it appropriately formal and get the practice. Also – be sure to check out the 2 student essays uploaded to myUCA/Space/Unit Materials – good examples of degree level written assignments. Take the time to read them.